Front row (left to right): 1. J. Van Loucks, 2. Louis G., 3. H. Westerman, 4. Billy?, 5. Arthur Clawson, 6. Donald Burr, 7. Lloyd Hagemann, 8. Robert Guthrie. Second row: 1. Betty Isernhagen, 2. Juleda Favilla, 3. Stella G., 4. Marie Roggi, 5. Karen?, 6. Helen ?, 7. Beverly Sandell, 8. Shirley Granna, 9. Louis Dentici. Third row: 1. Alice Smith (teacher), 2. Jean Critchlow, 3. S. Darrah, 4. Dorothy Hansen, 5. Shirley Armstrong, 6. Donivon Hailey, 7. Evagene Grosser, 8. Sylvia Hughes, 9. S. Crist. Fourth row: 1. Veldon Rodgers, 2. Chester Thompson, 3. Virgil Bretz, 4. Wayne Avilla, 5. Russell Rassmussen, 6. T. Loyola, 7. Earl?, 8. Jack Nickerson, 9. Clifford Crist. Credits: From the collection of Sylvia M. Hughes Pilcher. Thanks to Sylvia Pilcher and Karen Smith for identifying the kids in the picture. 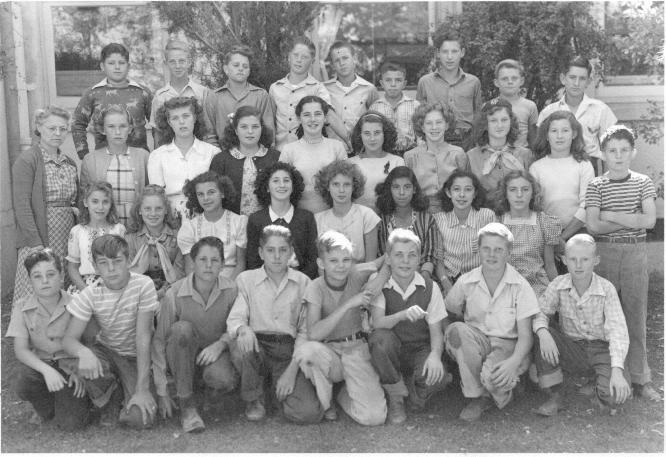 To find other pictures from Livermore Elementary School (now known as Fifth Street School) in the archive, see Livermore class pictures listed by school: Fifth Street School. And if you have any pictures from Livermore Elementary School that you would like to share, please submit them to the Archive.